I can't understand what people are seeing about these tires. I've got 70'000k on them and still have over 4mm left of tread. Aside from a huge snow dumping, I rarely have to use 4x4 for driving in snow. great traction in snow. However, nothing will beat a studded tire for traction. And off road traction is really good for these kind of tire. Would never buy these unless I lived somewhere hot and dry. Poor wet traction, horrible in the snow. I'm happy with these tires. I Have about 50,000 on these and they have around 4/32 left. For me they have done well on the road and on the beach, as well as hauling dirt and mulch. I got the LTs and keep them around 50psi. They have worn even and are as quiet as the Michilens they replaced. On my second set - 50,000 miles. Seem to be a good tire, at a good price. Have held up through both highway miles and off road travels in bad country. Note they are big tires for a vehicle like my Xterra. Maybe that explains better wear/performance than others. I have used these tires on my last 3 vehicles. Just put the second set on my Xterra Off Road. 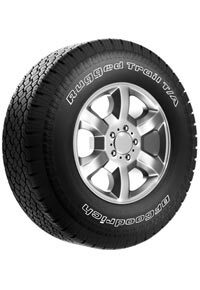 Great tire for versatility of interstate and off road use. The Rugged Trails did not offer much. They were stiff and responsive on dry road. Add 10K LBS of trailer behind you, a little water or snow then good luck! The factory tires are incredibly small for this vehicle, this truck SCREAMS for Toyo 285/75R17E 33.9H 11.3W 10PLY, so in the cart they go. The best tires I had, they lasted over 70,000 miles. They have been off road in the lava fields and back with no problem. Never let me down. Just bought a new set. I bought this vehicle used with 70,000 km and original tires. Still have 4mm tread but tires are starting to check from age. Very good performance, quiet, and excellent wear in my opinion. I am not sure if I missed the boat regarding the previous comments. I have gotten great mileage and traction from these tires. I had them on my 2006 Nissan frontier for over 35,000 miles, including highway miles. I was thinking quite the opposite that when they wear down, I will replace them with the same brand/type. Poor traction on wet surfaces. Terrible mileage. I got 18,000 miles, all highway miles on this set. Worst set of tires I've ever owned. These tires have horrible traction and they wear down too quick. They will only last you 30,000 to 40,000 miles. Would have thought for the price they would have been better. Never again will I buy these. Terrible truck tires. Only lasted 20k miles. Took them off and put BFG ATKOs on. They came with my truck, looking forward to getting rid of them.